Man's best friend is now kid's best friend with this plush Tug-Along Toy Pup. With his huggable body and durable wooden pull wheels, he's ready to follow his master anywhere! The Wooden Farmyard Fun Playset is a wood farm set complete with many farm yard accessories, that offers children unlimited fun farming adventures. 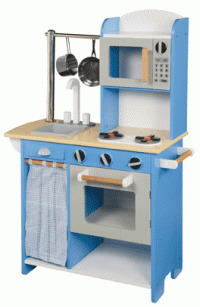 The Wooden Kitchen Center is a wooden toy kitchen set complete with appliances that will capture the imagination of children for hours, and maybe inspire a future cook. Wheel along some fun with the Wooden Wheel Set! It comes with 3 colorful vehicles that your toddler can push, pull, stack, or knock over, if they're that kind of kid.